That should resonate with Chutki who has been inactive in her blog. She would be thrilled to read what this blog talks about also as would my readers if they are a little patient. I was quite puzzled when I read the title suggested by Lin and did some research on the subject. Prior to that, I was quite ignorant about Thurber and his dogs. And boy was I glad that Lin suggested this subject and gave me the opportunity to learn about Thurber, his cartoons and his obsession with dogs. What took the cake however was an article that I read from the archives of The New Yorker which you should read to understand why I call it the cake. 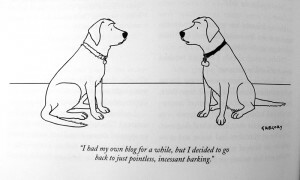 What more can anyone say about James Thurber and his dogs? This entry was posted in Blogging, Humor, People, Pets and tagged Adam Gopnik, The New Yorker. Bookmark the permalink. “Thurber’s theme is that a dog’s life is spent, as a man’s life should be, doing pointless things that have the solemnity of inner purpose.” Do you agree that is the way a man’s life should be spent? In the cosmic scheme of things Andy and I spend our lives doing pointless things, and we both have an inner purpose. I wouldn’t call mine very solemn though. What about you? Ramana, thank you so very much for bringing to my attention Thurber and that lucid article in the New Yorker. My morning has been enriched, my interest piqued. Jean, in her assertion that she wouldn’t call her “inner purpose solemn”, is missing the point. The dictionary’s definition of “solemn” being ‘dignified’, ‘serious’ and, most importantly, ‘deeply sincere’. If we weren’t sincere about our inner purpose (emphasis on ‘inner’) what would we be? Fluff? Fluffy? Fluffy fluff? You are totally unpredictable! I expected to come up all fire and brimstone against Thurber for being so hopeless about women! Yes, I have responded to Jean in a slightly different way. The dog’s dignity and nobility apparently was the common thread in all his works. i hadn’t thought of james thurber in years. nobody writes like him anymore. nobody! and the cartoons in the new yorker! in study hall i would take it off the shelf and lap it up like a cat does cream! thank you for that fabulous link rummy. a great post. i thank lin too! You don’t have to think of JT consciously. Your life is very Mittyesque which is very obvious from your blog posts! The link to the article was a Godsend for me to understand Thurber whose Secret Life of Walter Mitty of course was known to me but I did not know anything else about him. I had not heard of Thurber’s dogs either, Rummy. You chose my favorite; Jen and I can’t stop laughing at this one. I am glad that you liked the post and my choice of the cartoon which I see is featured in your post too. Yes, that is okay indeed for both of us.